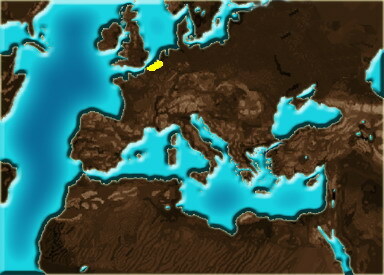 In 862, Baldwin Iron Arm, a son-in-law of Emperor Charles II, became the first count of Flanders. In the divisions of the Carolingian empire, Flanders became a fief of the French crown, but its powerful counts enjoyed virtual independence. The Count is supposed to owe loyalty to the king of France, but the king is weak and safely distant... for now. If Flanders is to ensure this level of indepence they will have to increase their economic and military power. The king of France will surely send his vast armies to punish Flanders for their disobedience! If Flanders wishes to remain free and expand it should first take the wealthy city of Antwerp under its control and build up and army to keep the French at bay and when the time is right invade one of the strong factions it's surrounded by! Hailing from Flanders, these men are armed with pikes and wear light armour. Rich Flemish Merchants equiped with Maces. Using their wealth to buy excellent armour and weapons they become the elite fighting forces of Flanders. Well armed and equipped Badelaar Militia. Able to wear chain and plate armour. Superior Goedendag militia, armed with a Goedendag and chainmail armour.